Secure Online Backup for Business: Don't lose your critical business data! Backup your entire office or server with our fully automated and secure online backup solution. 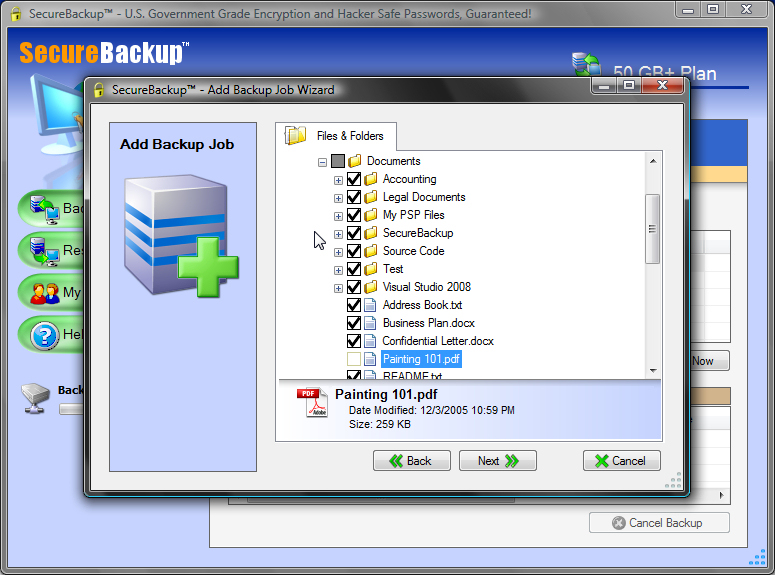 SecureBackup PRO is very easy-to-use and makes backing up and restoring your files a breeze. In addition, SecureBackup PRO provides FIPS 197 AES Data Security and Password Encryption that meets NSA Guidelines. Get started today with SecureBackup PRO Free 14-Day Trial! Restoring data with SecureBackup PRO is both fast and easy. Connecting to our backup servers is as simple as clicking on a button within the software. Unlike other online backup services, we know that when you need to restore your data you don't want to waste your time with a complex process or slow servers. Our servers and networks are very responsive and are optimized for speed. The SecureBackup software is engineered to be both secure and reliable. Thorough backup file verification checks are in place to ensure data integrity. Your backup files are automatically compressed, encrypted, and verified using carefully engineered methods. Your data is verified both before it is uploaded and afterwards as well. BackupXpress is your professional file backup software. Synchronize, transfer, backup and archive your directories and files. Backup and recovery tool, protect "connected world". Learn how to safeguard your computer against Internet security threats. Qweas is providing links to SecureBackup PRO: Secure Online Backup 3.1.3607 as a courtesy, and makes no representations regarding SecureBackup PRO: Secure Online Backup or any other applications or any information related thereto. Any questions, complaints or claims regarding this application SecureBackup PRO: Secure Online Backup 3.1.3607 must be directed to the appropriate software vendor. You may click the publisher link of SecureBackup PRO: Secure Online Backup on the top of this page to get more details about the vendor.